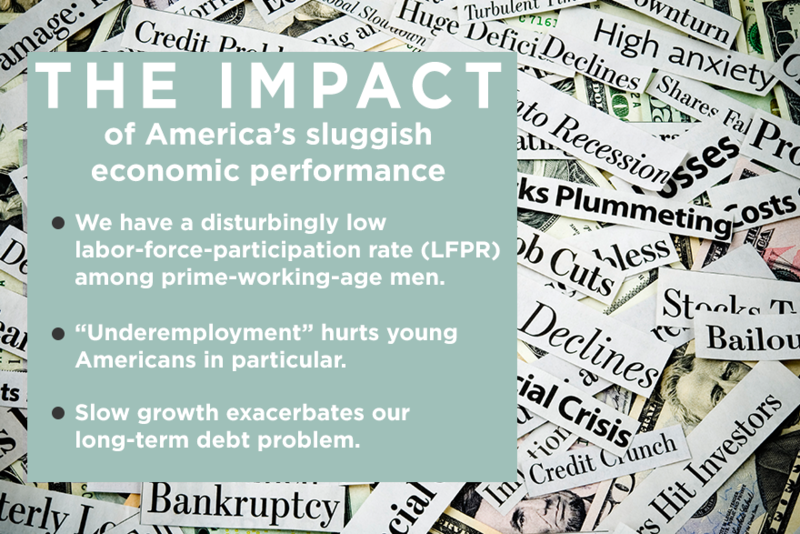 More than six years after the official end of the Great Recession, America’s economy continues to disappoint. The current recovery has been defined by slow GDP growth and even slower productivity growth. Some economists believe these are the predictable effects of a “debt supercycle.” Others worry that we face a long-term problem of “secular stagnation.” Still others blame recent fiscal, regulatory, and monetary policies. One thing is clear: Lawmakers need a comprehensive agenda for broad-based prosperity. We need to transfer more of our tax burden from income to consumption. We need to rebalance federal spending so that entitlements don’t crowd out basic research and development and other valuable discretionary programs. We need to expand apprenticeships so that high-school students have more pathways to a successful career. We need to transition toward a skill-based immigration system that serves our national interest. We also need to get rid of pointless occupational-licensing requirements that discourage work and entrepreneurship. We need to rethink land-use restrictions that constrain housing supply. We need to eliminate the Affordable Care Act’s employer health-insurance mandate in order to protect full-time jobs. We need to adopt patent rules that promote real innovation while curbing abusive litigation. We need to end “too big to fail” and make our financial system more conducive to stable economic growth. And we need to insist that all major federal regulations receive congressional approval before taking effect. Such reforms would increase opportunity and improve living standards.